Maitha Demithan holds a bachelor’s degree in fine arts from Zayed University in Dubai. Her work combines several mediums, including photography, scanography, painting, drawing, and photo transfers. As a child, she sketched her first drawings in the sand. This pastime formed her early appreciation for color, texture, line, and shadow. In her notable 2009 exhibition entitled Documentation at Tashkeel gallery, Demithan presented her scanned self-portraits for the first time. She also participated in Across the Gulf, a group show that was part of the ARC Biennial of Art in Brisbane, Australia, as well as Emerge in the Venice Biennale, Emirati Vision in Berlin, and the UAE Pavilion’s Biladi during the 2010 Shanghai World Expo. She has since exhibited in China, France, Germany, Italy, South Korea, Spain, and the United States. Demithan works and resides in Dubai. Maitha Demithan employs a technique in her digital works known as scanography. She uses a small flatbed scanner to take multiple images of her subjects and digitally enhances them to create ethereal portraits. The artist’s immediate family and close friends regularly serve as her subjects, who often appear floating on black backgrounds. During the creation process, Demithan enriches the colors and accentuates different textures, especially fabrics. 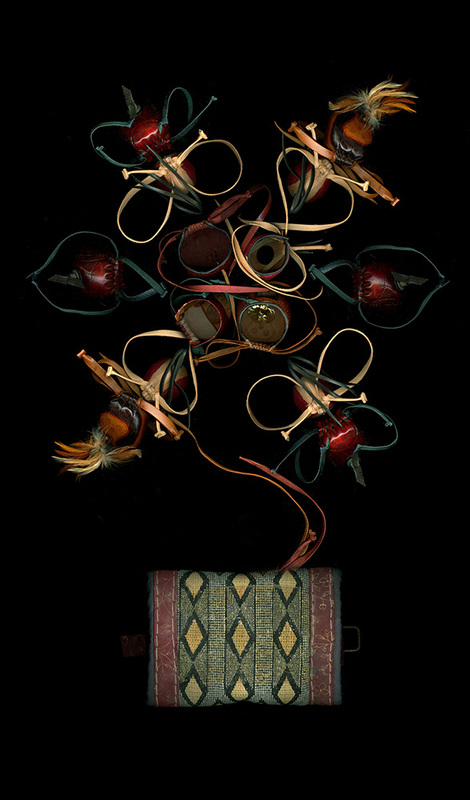 Her works express the value of family and clan traditions while also alluding to the past. Ajyal documents conventional dress together with falconry, where training practices are passed down from male family members to young men. In this artwork, the falcon symbolizes the Emirates, whereas the quail, its food source, is a metaphor for elders feeding their heritage to future generations.